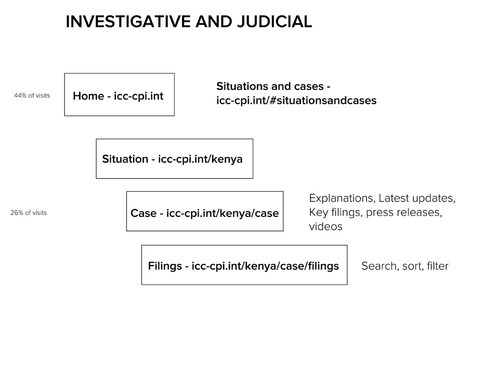 Some of the most important needs of the ICC website users revolve around the investigative and judicial work of the ICC. It is the “irreducible core” of the ICC’s work. It accounts for over two-thirds of the visits to the site. As such it has emerged as the best way to give shape to the website. And all the filings within the case will be available at http://icc-cpi.int/kenya/case/filings. 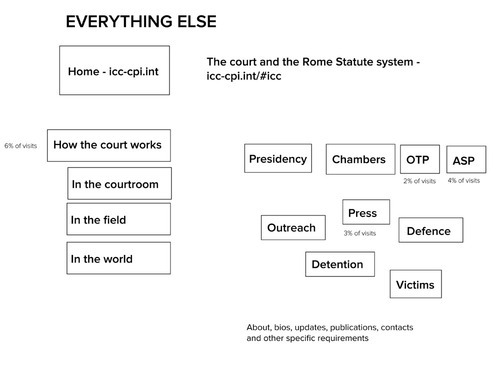 That just leaves “everything else”, which is to say that anything that does not deal with the investigative and judicial work of the ICC in the context of situations and cases will go in this other section. Each organ and section will also have its own section elsewhere, but we hope that the ICC can be explained more clearly and more compellingly by showing users how these different organs and sections work in context rather than presenting them as isolated units. The sections for each organ, section or body will be standardised. That doesn’t mean they will all look the same, but it will help the user to know where to go for the information they are looking for. We’re also going to take a lean approach to publishing in these sections. Rather than re-writing old content, we need to ask does anyone really need it? Using analytics and other data, we can make a judgement about whether to retire that content. Getting rid of this out-of-date content is good for stakeholders in the ICC (less to maintain) and good for users (less to sift through), so it is worth taking time to edit and prune. This alpha site will be a proof of concept. It won’t contain all the content and it won’t have everything needed to launch the website, but it will provide a basis for getting the things that matter most to your users right. If you have any questions about this approach or the project in general, please feel free to leave a comment or contact Public Information and Documentation Section.